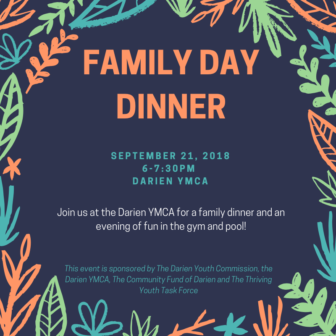 Come to the Darien YMCA on Friday, Sept. 21 for Darien’s annual “Family Dinner Day,” a free dinner for parents and their kids celebrating the simple things that keep families connected and strong. The evening event, from 6 to 7:30 p.m., includes dinner, swimming, open gym, arts & crafts, games, goodie bags and an evening of fun for the whole family. While this event is open to all, the organizers are focusing on families with preschool through elementary school aged children. The event is sponsored by the Thriving Youth Task Force, the Darien YMCA, The Community Fund of Darien & the Darien Youth Commission. Research shows that the more often kids eat dinner with their families, the less likely they are to engage in risky behaviors. In addition, these kids are more likely to have more family support, positive peer influences and positive adult role models. 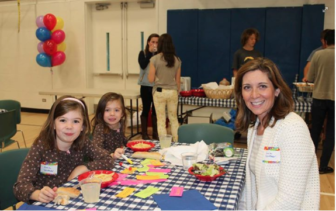 Darien is thrilled to again be sponsoring Family Day Dinner. This event is one way the community can continue to support the 40 Developmental Assets© the Thriving Youth Task Force has been actively promoting since 2008. The local event is part of a “Family Day” national initiative spearheaded by CASA — the National Center for Addiction and Substance Abuse at Columbia University). Family Day works with organizations across the country to educate parents about how everyday activities, like sharing a meal, playing a game, or asking about their day, can make a difference in the life of a child. With the support of corporations, community leaders, Major League Baseball teams, schools and thousands of local groups, Family Day helps communities prevent teen drug use. To RSVP (deadline is Sept. 19), simply e-mail youthcommission@darienct.gov. Please put “Family Day Dinner” in the subject line. In the body of the email, please include family name and number (and names) of family members attending. An acknowledgement of receipt of your reservation will be e-mailed back to you. For additional information, contact Alicia Sillars (asillars@darienct.gov). At 7 p.m. on Tuesday night, the Community Fund of Darien will present to the public its survey of 1,800 town students on risky behaviors and how well or poorly teens are avoiding them. The presentation starts at 7 p.m. in the Community Room of Darien Library. To the editor: On Friday, Sept. 22, approximately 150 people enjoyed the hospitality of the YMCA at the 7th Annual Family Day Dinner. The Community Fund of Darien will announce on Tuesday the results from a survey of 1,800 Darien teenagers from the 7th through the 12th grade. They were asked about aspects of their lives that encouraged and discouraged risky behaviors like substance abuse.